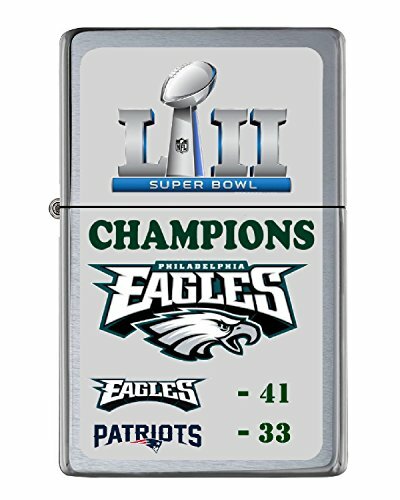 Philadelphia Eagles Super Bowl Champs Score Flip Top Lighter NUMBERED to 250 by Telesca at Kerinci. MPN: 3107ph1AA. Hurry! Limited time offer. Offer valid only while supplies last. Durable rich color vinyl image on front. This is wind proof and has replaceable wick and flint. This series of lighter is made of steel, increasing it's overall durability when compared to lower priced metal lighters. If you have any questions about this product by Telesca, contact us by completing and submitting the form below. If you are looking for a specif part number, please include it with your message.